Very cute popcorn boxes to fill with popcorn, cookies or candies. They are made of environmentally friendly sturdy paper, and they are reusable if you want. 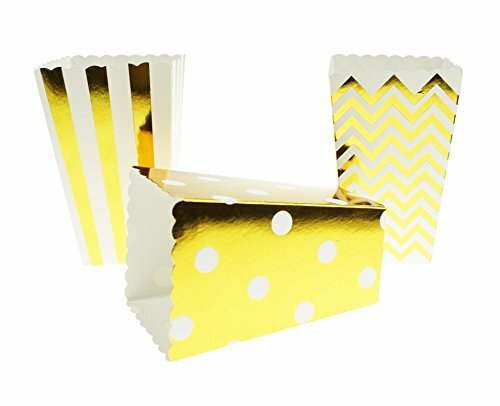 The popcorn boxes are with golden chevron zig zag , stripe and polka dot. The design is very simple and elegant. So they are suitable for many occasions. The movie popcorn boxes can be filled with popcorn, cookies or candies, and they are great for household use or movie theater use. The paper popcorn boxes are also perfect birthday party favors, baby shower party favor, and wedding party favors, especially great for movie theme birthday party, baby shower party, bridal shower party, wedding party, candy buffet, etc. They are also perfect candy bags for various parties, such as wedding candy bags, Christmas candy bags, baby shower candy bags, or Halloween candy bags, etc. Just use these elegant popcorn boxes for your next party and event, and they may make your party and event much more different. There are 8 golden chevron zig-zag popcorn boxes, 8 golden stripe popcorn boxes and 8 golden polka dot popcorn boxes, total 24 paper popcorn boxes in the package. The movie popcorn boxes can be filled with popcorn, cookies or candies. The popcorn favor boxes are great for household use or movie theater use. They are also perfect party favors for movie theme birthday party, baby shower party, bridal shower party, candy buffet, or birthday party, etc. If you have any questions about this product by Bilipala, contact us by completing and submitting the form below. If you are looking for a specif part number, please include it with your message.